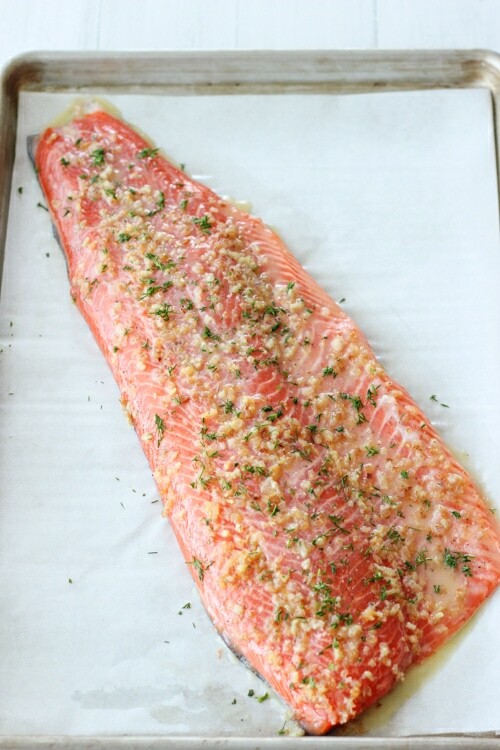 Baking a whole steelhead trout fillet is so simple but looks very impressive. Topped with shallots, garlic, lemon and fresh herbs – it’s so juicy and flavorful. You are guaranteed a delicious meal. Salmon can be used instead of steelhead trout, with excellent results. If you’re on the lookout for an impressive holiday dish that can take center stage, I have good news for you, your search is over! A whole side fillet of fish is always so extraordinary and looks beautiful when you serve it. It couldn’t be any easier to make either. I’ve made this trout when entertaining guests, but it’s simple enough (and delicious enough) that I make it for weeknight dinners for just our small family. The fish is perfectly juicy, flaky and full of flavor. Shallot and garlic are great flavor buddies in this dish, that are mild with just the right amount of aroma. 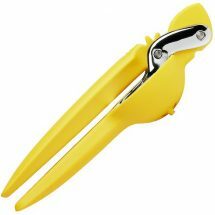 I love the addition of lemon zest, which also perfumes the fish and the freshly squeezed lemon juice gives a bright note of acidity. 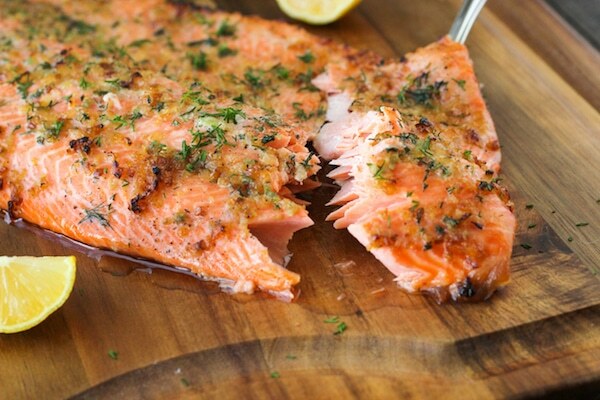 You can use salmon instead of the trout. 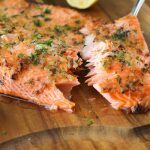 If you’re using salmon, it tends to be a little bit thicker than steelhead trout, so you might need to cook it just a few minutes longer. 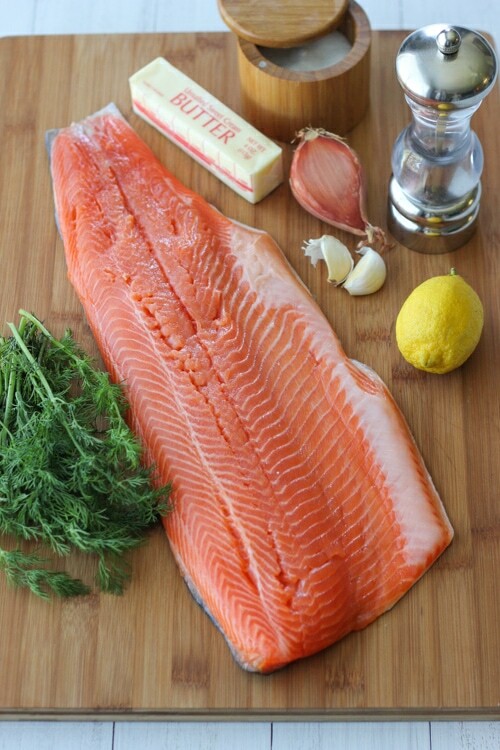 You can prep the fish ahead of time, and keep it in the refrigerator until you’re ready to put it in the oven. 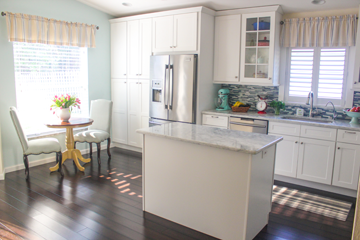 It’s very convenient for Sunday dinners, holidays or other entertaining events. Preheat the oven to 450 degrees Fahrenheit. 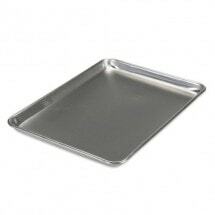 Line a rimmed baking sheet with aluminum foil or parchment paper. 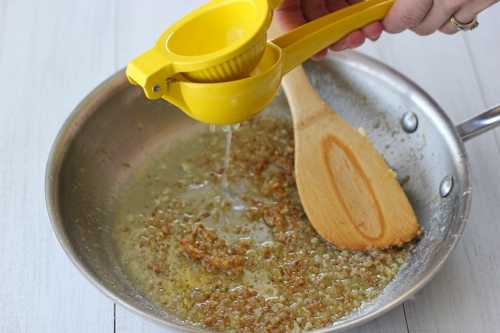 In a skillet or small saucepan, melt the butter. Add the shallot and cook on medium heat for about 3 minutes, until the shallot softens. Add the garlic and lemon zest and cook for another minute. Cool slightly. 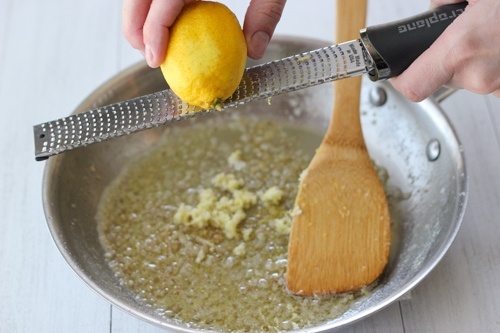 Squeeze in half of the lemon juice. Place the fish on the prepared baking sheet. If it’s really big, lay it diagonally across the baking sheet. Season with salt and pepper. Spoon the butter over the fish. Roast in the oven for 12-17 minutes, depending on how thick the fish is. 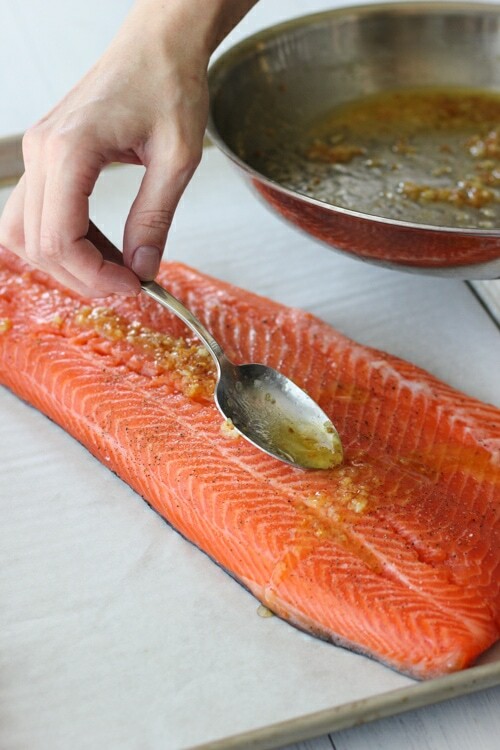 The best way to check for doneness is to use a fork to gently prick the fish, and if it flakes easily, it’s ready. 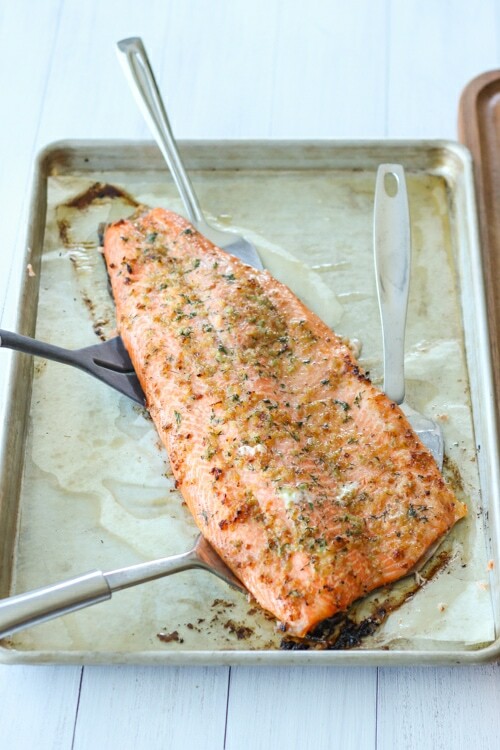 Use several spatulas to take the fish off the baking sheet in one piece. The fish will come right off, leaving the skin behind. What a neat trick, huh? Roll up the aluminum foil or parchment paper, the skin comes right off and it’s so much easier to wash the baking sheet. Squeeze the other half of the lemon over the fish and sprinkle with more fresh dill. 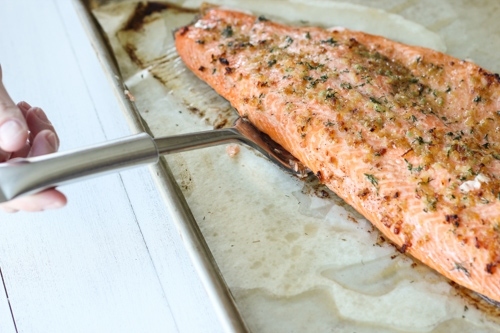 You can grill the steelhead trout instead of baking it by using this exact recipe. 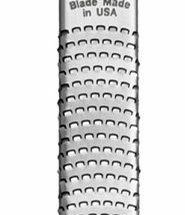 Tear off/cut off a rectangular piece of heavy duty aluminum foil so that it is several inches bigger on all sides than the fillet that you will be grilling. Crimp the edges of the foil, creating your own “rimmed baking sheet”. 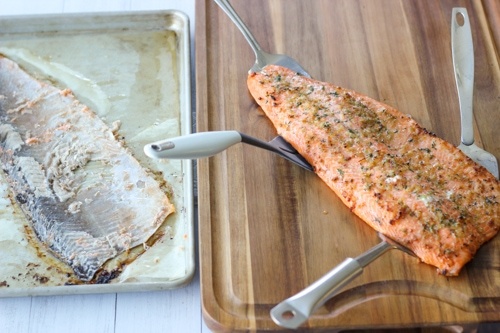 This will keep your salmon from sticking to the grill and is such an easy way to transfer it on and off the grill, but at the same time get a great grilled flavor. Place the fish fillet on the prepared foil and continue with the rest of the recipe, seasoning the fish and adding the butter, shallot and lemon topping. Preheat the grill for at least 15 minutes on high heat. Place the seasoned fish on the hot grill, reducing the heat to medium high. The whole fillet should cook for a total of 8-15 minutes on the grill on medium high heat. A smaller fillet will cook for 8 minutes and really large fillets 15 minutes. Don’t overcook the fish or it will be dry. 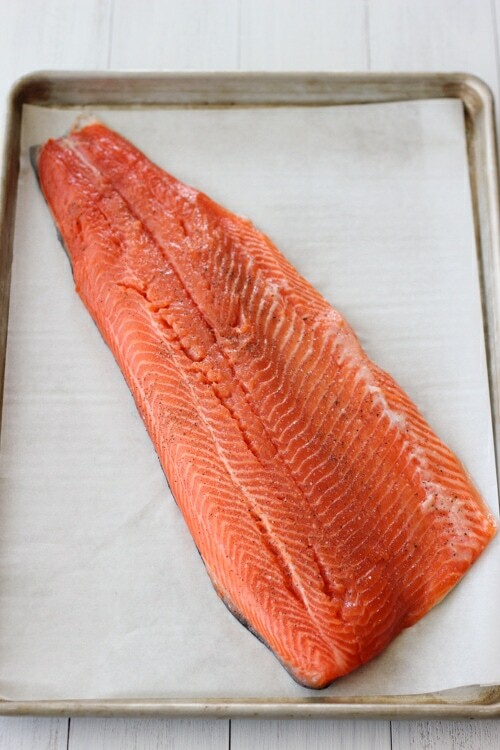 Baking a whole steelhead trout fillet is so simple but looks very impressive. Topped with shallots, garlic, lemon and fresh herbs, the fish turns out so juicy and flavorful. Yummy! Will make this in the near future!! Olga, I love the simplicity of your recipes and all natural ingredience, I also love you. Lol keep up the great work. Thank you, Walter! I appreciate the kind words:). 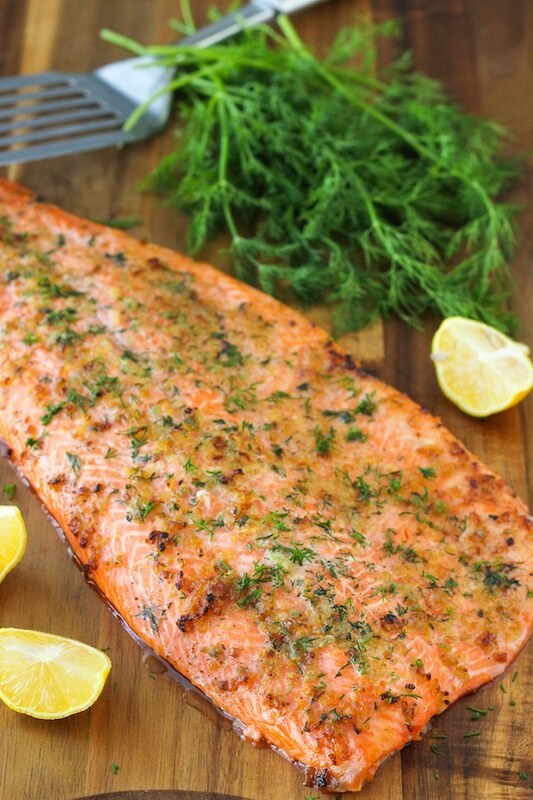 Olga, I love this recipe for steelhead! It turned out delicious! Flaky, with just enough spice flavor to not detract from the delicate fish. That’s great, Jacob! Happy to hear that you enjoyed it. I made this for dinner tonight but I used salmon, It was delicious! Thank you for the great recipes! I love your tip about the foil. It really worked!!! Thanks for the easy cleanup, and we cut the fat calories. 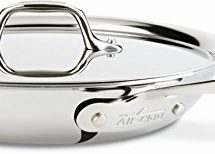 Foil is one of my best friends in the kitchen, because I don’t like scrubbing pans. I use it and parchment paper all the time. You should research what aluminum foil does to you. Bad bad bad. The recipe is great tho! This is exactly what I’m looking for. Will be cooking tonite with responce to follow: can’t wait. That’s awesome Jason! I’m glad you enjoyed it. Just made this tonight and LOVED it! I am not a big fish eater but I may be after this dish! I loved the tip about baking on aluminum foil. The fillet came off the skin just as easy as you said. Great recipe! That’s great, Martha! I’m glad you enjoyed the recipe and the tip:). this is really yummy but instead of shallots I used a small amount of onion..
I’m glad you enjoyed it, Alaina:). Thanks for posting the recipe. It worked and everyone loved it! I’m a brand new follower of your blog. I found you by googling recipes for steelhead trout. I absolutely love this recipe. It was delicious and so easy. I highly recommend it to others and will make it again soon. Also, love your overall philosophy of life. I look forward to cooking many of your recipes soon. 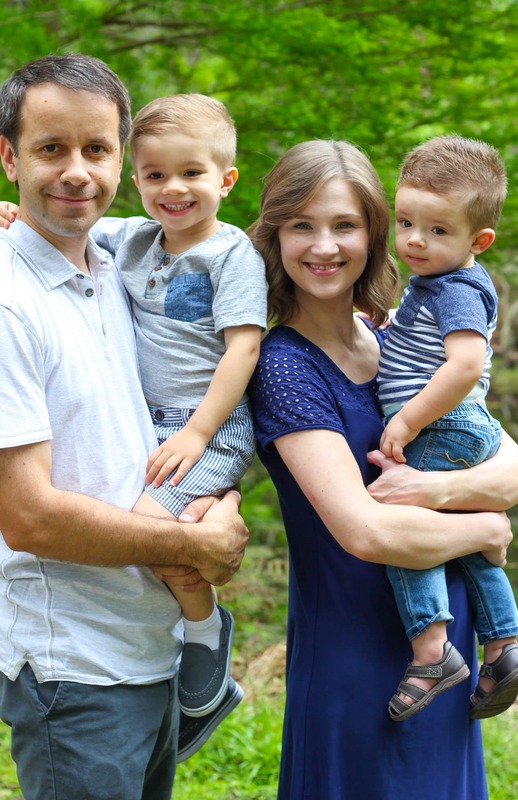 Welcome to the blog:). I’m so glad to hear that you enjoyed this recipe. 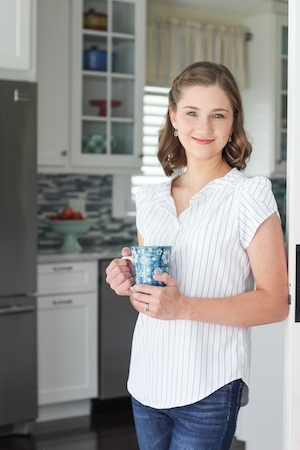 I hope you’ll find many others recipes that will be just as enjoyable. Absolutely delicious. I used unsalted butter, but then salted the melted butter with a lightly smoked sea salt. I also cooked this in the over on a cedar roasting plank. I decreased the temp to 400 once it was in the oven as we like salmon and trout more on the rare side. The shallot and garlic crisped up nicely on top of the trout and made for a delicious burst of flavor. Thanks, Olga! I’m so glad you enjoyed it, Ryan:). I am trying this tonight. Can’t wait to see how it turns out. This recipe was absolutely delicious! So simple, yet so flavorful. Thank you so much for sharing. You’re welcome, Vicky! Thank you so much for taking the time to write. Made this for company tonight and Everyone raved about it. I reduced the butter to 1 TBPS and added 3 TBSP EVOO. SUBSTITUTED onion for the shallots. I used dried dill, however fresh would have been much better. I actually made the butter sauce a few hours ahead. THIS RECIPE IS A REAL KEEPER. Easy and made a nice presentation for company. Thank you so much for sharing this special treasure. That’s wonderful, A Murphy! Thank you so much for taking the time to write. This is a real favorite in our family and I am so glad to hear that you enjoyed it as well. 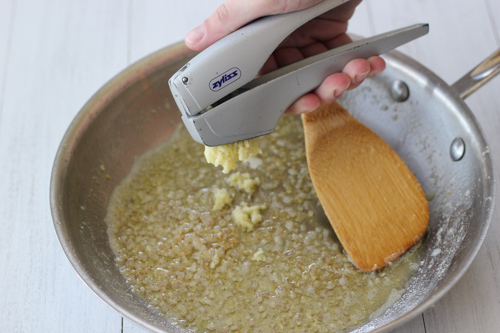 I often make the butter sauce ahead of time. It’s such a simple and quick recipe, but always a winner. Tried your recipe last night, switched it up a little bit used sweet onions & green onions. We are not much into garlic & dill , do not like shallots. The fish turned out great, receipe is a keeper……….OMG my fish was so good. I had not cooked steele head trout so I had to find a recipe on how to cook it, so glad that I found your recipe. The fish lifted right off the foil & all the skin stayed on the foil, wonderful !!!!! That’s great, Sherry! So glad to hear that you enjoyed it. Sounds like you did an awesome variation. This is by far my favorite fish recipe. I make this recipe too often. Love it. Thank you so much Olga! I would have to agree with you, Vicky. I use this recipe very often when I make dinner myself:). I love how simple it is to prepare. Thanks for taking the time to write. Olga, this was absolutely wonderful. Thank you for posting this wonderful recipe and for the tips (using foil, multiple spatulas, etc.). I never realized how beneficial it was to cook salmon/steelhead at such a high temperature, nor did I realize that it was ok to prepare the basting sauce separately like that. I always thought applying a warm sauce would spoil the cooking process. In this case, it made it perfectly simple and delicious and I will NEVER prepare salmon any other way EVER again. Thanks! PS- I didn’t realize you could bake parchment paper at such a high temperature. You’re welcome, Katie. Thanks for taking the time to write. 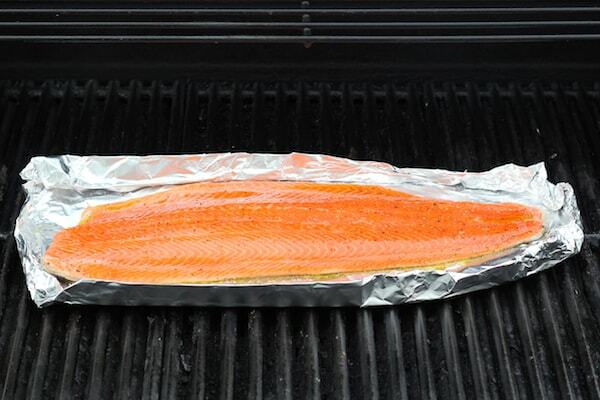 I use aluminum foil all the time when cooking fish. It makes cleanup so much easier. However, some people are opposed to using any aluminum foil at all, so parchment paper is another option. The oil from the fish will leak down into the pan, but nothing sticks to the pan, so it still makes cleanup so much easier. That’w wonderful, Oscar! I’m glad you liked it. That’s awesome, Jack! I love to hear that. 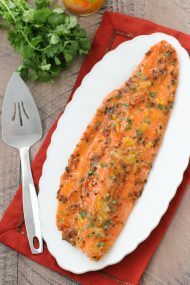 This recipe looks delicious I have purchased a 3 steelhead trout and plan to try your recipe tomorrow . I hope you enjoy it, Pat! I’m glad to “meet” another Floridian. Moist and delicious. I substituted rosemary sprigs for dill, and removed them before baking. I added a tablespoon of dry vermouth. Baked 10 minutes at 450, then reduced heat to 325 for 5 more minutes. Try this. Preheat oven and cookie sheet to 450º. On a cooke-sheet size of aluminum foil, place a smaller piece of parchment on foil, cover with kosher salt, place filet skin side down on kosher salt, then season as directed. I use only olive oil and a thin layer of Chinese garlic chili paste. Slide aluminum foil with parchment and filet onto blazing hot cookie sheet. Bake 17 minutes. Thanks for sharing, Gail. It sounds lovely. I really like using the blazing hot sheet method for many recipes. It’s such a brilliant technique. Just made this today Steelhead I left out the Dill as I didn’t have any. It turned out lovely looks and tastes good too I want to eat some But I can’t as I have to wait for my wife to come home and join me. Rainbow trout is usually a lot smaller and more delicate than Steelhead Trout, Laurie. You can use this same method for rainbow trout, just cook it less. That’s wonderful, Michelle. Thank you so much for taking the time to write. I am so glad you enjoyed the trout:). Am I the only one who thinks fish skin is delicous, and wants it to stay on? 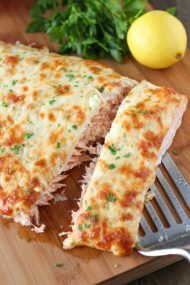 I love baking a half salmon fillet with the skin on, I think the skin is the best part, like with chicken! I think I read also that fish skin is where most of the Vitamin D is stored, so why would you want to waste that? I actually like fish skin too, Tanya:). Most people that I know don’t, though. Plus, it means that you don’t have to take the scales off the skin, if you will be discarding the skin anyway. If you DO want to eat the skin, just grease the baking sheet with oil first, and the skin should get nice and crisp and you’ll still be able to get it off. You know, I only thought of ‘scales’ after I posted! Every half fish I’ve ever bought has been descaled..! And I’ve only found one small scale in a bite that was missed! I made this last night, and oh wow was it ever good! I was missing the shallots & my dill was dried not fresh, but it was still yummy! I think steelhead trout is tastier than the salmon I usually buy! I will definitely be making this again! And yes, I was scraping the skin off the foil, it was that good! I prefer steelhead trout too, Tanya. Whenever I buy fish, there are always so many scales left; I guess our seafood department workers don’t do as thorough of a job as your do. That’s really thnnkiig out of the box. Thanks! Thank you, Heidi. I hope you enjoy it. And how many grams or oz is in a serving? I’m sorry I can’t be more helpful, Rosana. I don’t count calories, and the serving size is a very rough estimate, since everyone eats different portions and has different appetites. That’s awesome, Brian. We like to use the grill whenever we can too:). I’m so glad to hear that this recipe worked out for you. Thanks for taking the time to write. 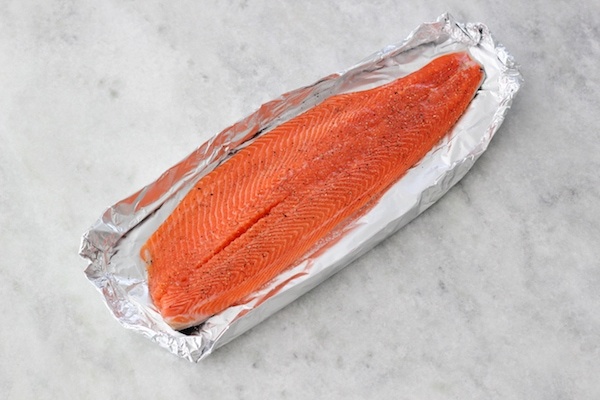 Should i fold the foil over and crimp edges together to create an airtight packet for the salmon! 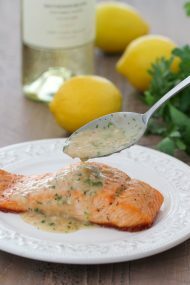 If i use lemon for salmon before making this dish to cancel the bacteria, what should i do to control the flavor? 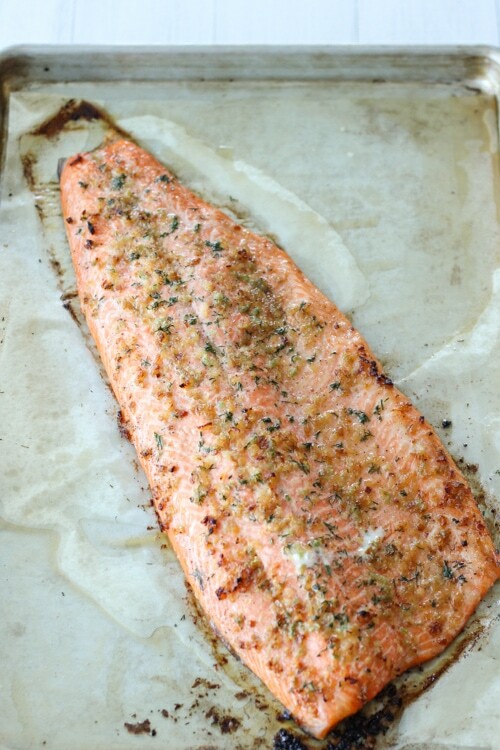 I really like this recipe, making steelhead right now! I like steelhead trout better too:). So glad you enjoyed this recipe, Heloise. I can’t wait to make this! Do you mind my asking where you buy the steelhead trout? What grocery store? Just wondering what stores have the best/freshest fish. Thanks, Olga! !